Indonesia’s Son of Krakatoa Erupts After the Mount Soputan Volcano Erupted Close to Fridays M 7.5 Quake and Tsunami – Coercion Code – "Dark Times are upon us"
Video footage shows the vast volcano erupting (Image: @Sutopo_PN-Twitter) A second volcano eruption has occurred in Indonesia just hours after the Mount Soputan volcano erupted on the same island as the M7.4 quake and deadly tsunami which has left 1,400 dead from the tsunami and a further 2,000 dead from landslides. 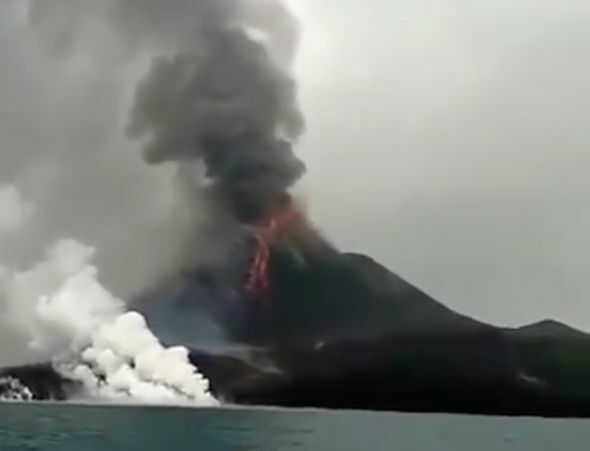 The vast volcano, known as the Son of Krakatoa, is spewing lava into the air as the region is hit by another natural disaster. According to the Daily Express, Lava is also running down the volcano’s slopes as the region reels from the devastation left by a magnitude 7.5 earthquake and consequent tsunami on the Sulawesi island last Friday. Indonesia is located in the Ring of Fire region, one of the worst affected areas by earthquakes in the world. A second volcano eruption has occurred in Indonesia just hours after the Mount Soputan volcano erupted on the same island as the M7.4 quake and deadly tsunami which has left 1,400 dead from the tsunami and a further 2,000 dead from landslides. Lava is also running down the volcano’s slopes as the region reels from the devastation left by a magnitude 7.5 earthquake and consequent tsunami on the Sulawesi island last Friday. Indonesia is located in the Ring of Fire region, one of the worst affected areas by earthquakes in the world.